Besides California, naturalized in Alabama, Pennsylvania, New York, Australia (New South Wales, Victoria), Portugal, Canary Islands, Libya, Argentina, Chile. Naturalized in 4 California counties. Other areas similar to California are Portugal and the Canary Islands. 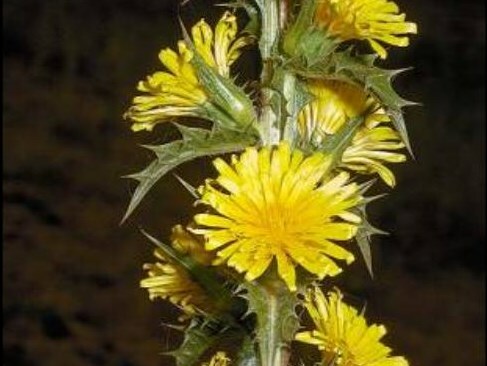 Listed as a noxious weed in Victoria, Australia, where it invades grazing lands and "neglected areas". Considered a problem in Argentina and Chile. Listed as a noxious weed in Victoria, Australia. However, the locations where it is present in Victoria do not match California. Locations on GBIF from Australia are not a good match to California. There is only one location from Chile so I do not know how widespread it is or whether the locations match California. Scolymus maculatus is a listed noxious weed in New South Wales (Moree Plains Council Area), in a section of NSW that matches California. Dense patches become impenetrable to livestock. Forms dense infestations in Australia. Taproot and young shoots are edible to humans. Weed of grazing lands in Victoria, Australia. Not eaten by livestock because of the spines. Livestock avoid grazing close to plants. Answering yes because of impacts on livestock. Dense infestations become almost impenetrable to grazing animals in Australia. Flowers in late spring and summer and seeds germinate in autumn, winter, and spring. Yes, can be a biennial. Flowers are formed in late spring and summer. Unclear how long seeds are produced. Spiny heads can be caught in wool (and therefore spread by sheep). Wind is important for dispersal. The plant breaks off at the ground and is blown long distances. Seeds also transported by water. Spiny heads are caught in agricultural produce. Some spread by agricultural equipment.